More blue food, for you blue addicts. Welcome back to the Makin’ it Blue craft corner where we take some of your favorite little day to day items and what do we do? Well, we teach you how to make it blue, of course! This week, we're going to be turning away from the sweet foods (I've gotten some complaints about a few ADD campers on sugar highs) and we're going to get into the.....savory! Yum!!! So, turn up the gas on your indigo grill, and get ready to start makin' it blue! Does teal count as blue? I think it dooooooes. In a heat-safe measuring cup, bring the milk up to temperature in the microwave (110 to 115 degrees is ideal), add the blue food gel dye to color, then the yeast, stirring until bubbly. In the bowl of an electric mixer, stir together the flour, sugar, and salt. Use the dough hook to add the egg, butter, and slowly add the yeast mixture just until the dough comes together. Flour the surface of parchment paper on a baking sheet and turn out the dough. Knead a few times then divide into 10 equal balls. Preheat the oven to 375 degrees. Brush the tops of the buns with the egg wash and bake for 14-18 minutes. Let cool on a wire rack. Once cool, cut them in half and cook your meat and add your toppings! 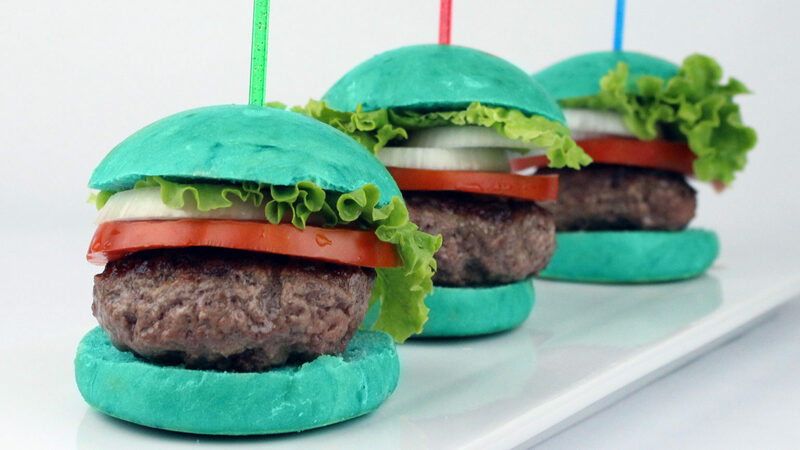 Honestly, all of these foods are a little bit teal. I suppose that savory means not getting as deep of a blue as you'd like. HOWEVER, look how yummy that pasta looks!!! Imagine putting having a little red sauce and cheese sprinkled on top. What a patriotic pasta! Knead together all ingredients. Add some drops of natural blue food dye and some baking soda. 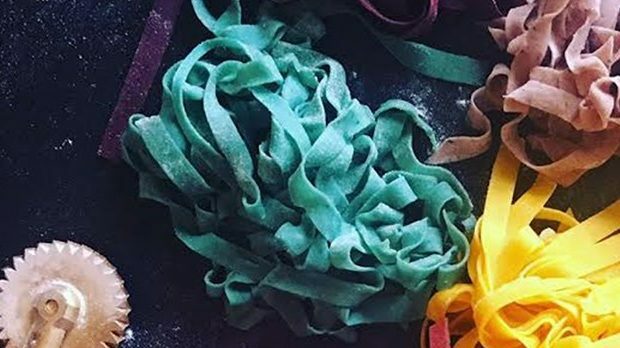 Using a rolling pin, roll out the natural blue pasta dough and cut it into strips. Bring water to a boil. Slowly add 1/2 tsp baking soda to the water: it’ll fizz and bubble furiously! Cook noodles till they rise to the top (for about 1 or 2 minutes). Let's hear from the Camp! 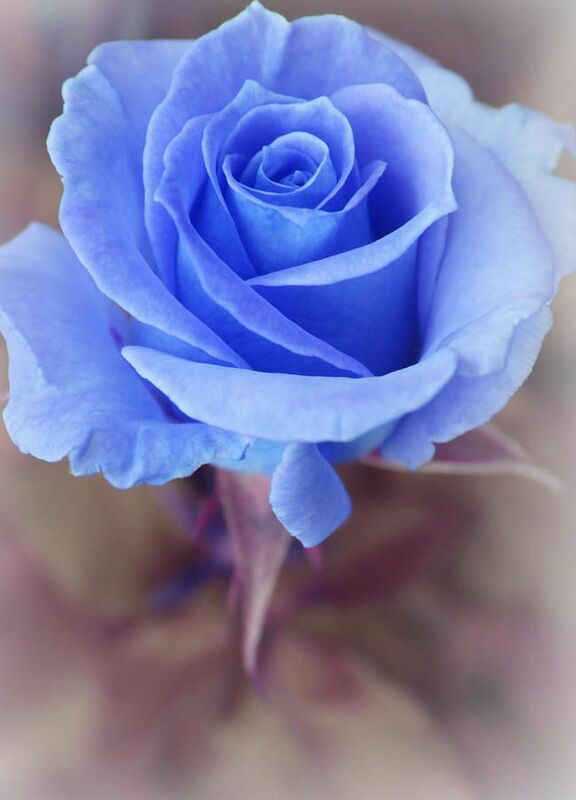 "Hm... Well my favourite blue thing would beeee Aimee, wait she isn't actually blue in person I MEAN BLUE ROSES! But honestly, have you seen anything more majestic than a blue velvet rose? The colour, the feeling of their petals on the skin and the hard work to create these flowers who sadly don't grow in that colour without human interference. This totally doesn't have anything to do with my surname or that my ancestors not the godly side, though mom loved them too made and still make a living out of roses." More nature! Something you and Wennie, er...Arwen have in common! And I gotta admit, they are soooo pretty! Welp, that’s all for this week, folks. Be sure to pat yourself on the back for doing such a good job with not inhaling all of the noxious fumes of gas or steam Or, if you happened to burn down your kitchen, don't worry! It happens to the best of us and I can build it back up for you! So, as per usual, get your gigglies out and dance!